Please note the following copy is written by a third party and does not necessarily reflect the opinion of bit-tech. ROCCAT and bit-tech are teaming up for Insomnia 58 from August 26 until the August 29 at the NEC in Birmingham. Together, we will provide six lucky winners the most exclusive Insomnia experience available. Winners needn’t even worry about the travel cost (as long as they hail from the continental UK, Northern Ireland and the Isles are excluded). ROCCAT and bit-tech will arrange for the trips to and back home from Insomnia 58. At Insomnia the winners will find powerful gaming PCs sponsored by Alienware and equipped with Dell monitors. Additionally, they are fitted with the latest and greatest peripherals from ROCCAT. Each gaming station is of course easily able to play the hottest and most recent games with high definition graphics and decent frame rates. Each system will come pre-loaded with a set of popular games, ensuring that the fun can start instantly. You can also request certain titles be pre-loaded onto the machines if there's something you're itching to play. DX Seat provides gaming chairs, which offer a maximum level of comfort. This enables every winner to play for hours on end, without ever tiring at all. Should anybody, for whatever reason still feel slightly tired or stiff-in-the-neck, then our local massage team will take care of that. Our energy drink partner Effect, will help with an extra caffeine boost in tight situations, and snacks will be on hand too. For a well-rounded package, we will offer the Early Arrival Service to the BYOC grounds, so you can arrive on Thursday August 25 after 6pm should you wish, as well as exclusive tickets for the 'Pub quiz night' (18+ only), should any of the winners be interested in taking part in this event. Of course, the winners get to keep all ROCCAT gear at the end of the event. 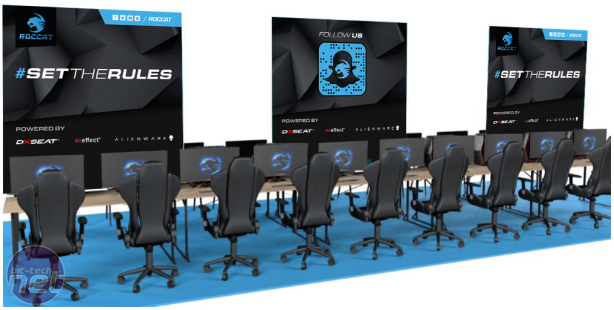 We wish everybody the best of luck and are looking forward to meeting you at Insomnia 58. Indoor camping accommodation - you will be responsible for bringing a tent, sleeping bag etc. Anyone wishing to use alternative accommodation will be responsible for that themselves. Drinks and snacks. Extra food and drink may be required and winners will be responsible for providing that. The prize draw is open to UK mainland residents only aged 16 years or over. The competition winners will be picked at random from all eligible entries that arrive by midnight of the closing date, August 16, 2016. The winners will be notified via email on August 17, 2016. The winners must claim their prize by August 22, 2016. If any prize is unclaimed after this time, bit-tech reserves the right to offer the unclaimed prize to a substitute winner selected in accordance with these rules. Each winner will be eligible for one pair of ROCCAT VIP Insomnia 58 tickets, as detailed above. The Sova wants a seat on your sofa - can it make keyboard and mouse on a couch comfortable?